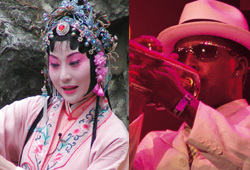 A unique jazz-infused journey through the kingdom of Kunqu Opera with Belgian musician Jean Maljean and singer Zhang Jun will give this ancient Chinese art form a sophisticated, modern twist. What happens when jazz meets Kunqu Opera? Will it be a spark or a conflict? All will be revealed at the forthcoming concerts co-presented by Belgian pianist/composer Jean Maljean and dynamic young Kunqu Opera singer Zhang Jun. Maljean, former lead singer with pop band Maljean-Willems for more than a decade, has composed original piano music that combines elements of classical, pop, New Age and jazz improvisations to form his own unique style. In recent years, he has been introducing his own soothing and elegant interpretations of Asian musical styles into his music. For the Shanghai shows, Maljean will take the listener on a journey of immense beauty and peace through ancient Kunqu Opera. He will fuse East and West to create jazz music which perfectly matches Zhang's singing of excerpts from "The Peony Pavilion," "The Story of the Jade Hairpin" and "The Palace of Eternal Youth." "I will also bring my own music to this concert," Maljean says. "We are trying to make the show a fun and unique experience." Maljean's piano solos will include "Funny Face" and Chinese folk song "Jasmine Flower." The concert will be a breakthrough for the 600-year-old traditional Chinese opera, which originated in Kunshan, neighboring Jiangsu Province, in that it is set to attract both a young and Western audience. This opera form was listed by UNESCO as a Masterpiece of Oral and Intangible Heritage in 2001 and is considered the progenitor of many traditional forms of Chinese operas. For Western audiences, this ancient yet elegant art form is best characterized by the slow rhythmic and gentle movements that accompany the haunting melodies. "The accompanying jazz will ease the listeners' journey through the kingdom of Kunqu Opera," says singer Zhang. The concert actually is not the first to merge traditional Chinese theater with Western music.